For the last few weeks, we've had thundery weather. Most of the time I enjoy lively weather so it's been interesting. ...which translated into impressive lightning that night. The girls laid in a wagon and just watched the show. When the cell moved too close for comfort, we retreated indoors and lit a lamp in case we lost power (we didn't). 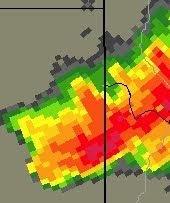 July 16: A massive and dangerous storm headed our way, with half-dollar sized hail. We sprang into action and battened down the hatches. But what to do about the cars? We didn't want cracked windshields from the force of the hail. We hit on the idea of cutting up one of the gigantic rubber inner-tubes from the tractor tires we got for the garden. We draped the pieces over the windshields and anchored them by closing the doors on the edges. Worked beautifully. I can see a lot of advantages to having big sheets of rubber hanging around. The storm promised to be a whopper. I seldom see purple inside the Doppler radar pix -- but there it is. In this case, the storm skirted just barely to the south and west of us, so we were spared the hail. 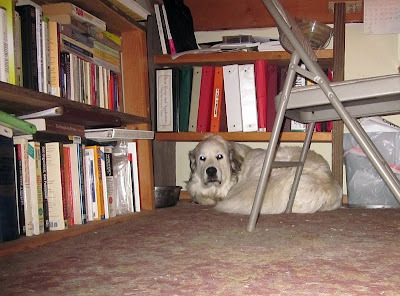 By the way, this is where Lydia can be found during any and all thunderstorms. It's amazing how she manages to cram her enormous body into that tiny cave. July 20: I awoke this morning to dawn lightning and thunder, and stepped out on the front porch to see an early rainbow. See the dawn's early light shining through the Virginia creeper leaves onto the wall? It also lit up the rainbow in the distance. ...but prepping them for spraying took longer than we anticipated and a storm cell caught up with us, so we hastily shoveled everything into a more protected (but cramped) area of the barn until the weather passed over. ...but now the sun is shining. What's the old expression? If you don't like the weather, just wait five minutes. All that bolt lightening puts nitrogen in the soil, according to one old timer I know. Never seen a look even remotely like that on that puppity's face. I know that look. Bless her heart. It's humid and rained all night last night. It feels like and looks like we could get rained on all night again. Fortunately we have three very good and busy kitties, resulting in three deliriously happy ravens who get the trophies of the hunts. So did you get hail today? I live in N. Idaho and am glad the almost baseball sized hail skipped my garden. We got the rain ..but no hail. PTL. I sat in a rocker on our covered front porch .. just watching the sky dance. Wind .. lightening .. and booming thunder. Great pictures! I liked the radar references as well, being from Texas, I can relate to fast changing weather. Yes, spare rubber is obviously a great item to have lying around! Who would've thought? Great pictures! hey, I thought the expression, 'If you don't like the weather, just wait 5 minutes' was coined in Oklahoma!! Impressive lightning pictures! So cool that your kids will sit outside and watch for awhile. Mine absolutely hate storms. :( Good idea about the sheets of rubber! Probably no the place to ask but I can't figure out how to email you. Patrice, we are looking at a heifer for a family milk cow. She is mostly Dexter and a little Jersey. She is 20 months old and bred to a Dexter bull. The only problem is she only has two good teats. The other two are fused. The vet said that they are functional for the calf but would obviously be problematic to milk. I believe I remember you blotting at one time about buying a cow with a dead quarter st a reduced cost and feeling like that was not a bad idea for a family milk cow. Do you have an opinion on a fused teat. We figure we could give her a go and if she can't be milked we could raise her calf( if she were a heifer) and send her mom to the freezers but what if it is genetic. Any opinions, anyone? I have no problem buying a milk cow with some teats not working. I don't know what a "fused teat" is, but if the calf can make use of them, then it sounds fine. I would be more concerned about a history of mastitis or the general disposition of the cow. That said, there is indeed a possibility of passing this trait on to any future heifers the cow may have. Most die-hard breeders would be dead-set against deliberately breeding a cow with a flaw like this, arguing that it's the breeder's responsibility NOT to pass on poor qualities to future generations. That said, not everyone can afford to be picky. Having not seen the cow in question, I'm afraid I can't give you advice one way or the other. Go with your gut, but remember you get what you pay for. Our Matilda (Jersey) is a beloved member of our farm, but I now know she's a poor-quality milker (we've had udder issues from the start with her). That doesn't mean I don't love her like crazy, though. My dog, Bear, is the same way with thunderstorms. He gets as close to me as possible and looks at me with eyes that say, "protect me, Mom!". Usually, he considers it to be his job to protect us with his big ol' bark. We did get hail down here that was dime-size and a little bigger. We've already picked all the cherries and haven't found damage to anything else. Sure was exciting while it lasted, though! Do you even realize just how good a photographer you are? The pictures you post on the blog are fantastic! I know, they're not ALL perfect. ;) But, most of them are great! Thanks for everything you do with this blog! Aw thanks. My kids tease me about how the camera is surgically connected to my hand, but I think I'll admit to having a hidden photographer inside me trying to get out. We did not get the hail, but we got lightning and rain and big winds! A couple of hours after it blew thru, I went out to feed and collect eggs. My poor garden! The corn was blown over sideways and all my squash plants, winter and summer, were all leaning severely sideways. Fortunately, I had already tied my tomato cages to the hoop panels with baling twine so they were only knocked over a little. I think I would have had broken tomato plants otherwise. I spent an hour gently standing my corn stalks up and packing soil around their bases and uprighting all the squash plants. So far, everything looks like it will survive. Praise God. Nice pictures. We took some great cloud pictures the other evening, too. 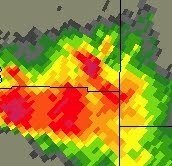 No lightning photos though, just watched from inside the house because we were getting stuff directly overhead. Good luck, let us know how she works out. My GP is scared of thunderstorms too. And it amazes me that such big animals can get in the smallest of places. Wonderful stock dogs and protectors tho.